Meredith, Suz, and I love learning about new fitness startups. While not the most athletic girls in town, we always find it rewarding to be healthy and get a good workout in. Meredith is a regular at The Club by George Foreman, Suz is a seasoned yogi, and you'll find me over at Recycle as many mornings as I can get myself there. But besides finding a good gym or studio, a great workout outfit or new fitness accessory can always give you a little boost of motivation. So, we're turning to these four startups to keep some excitement in our workout routines. Janji is a fitnesswear company that gives back in a major way. Every item purchased provides clean drinking water for people in need. Founders, Mike and Dave are avid runners and create functional workout clothes that people want to wear that also draw attention an important issue. The word "janji" means promise in Malay - signifying the company's promise to use the power of running to fight the global water crisis. Love the nutritional boost of spirulina but can't stand spending $10 on a green juice with a supplement shot? Try Energy Bits for a more affordable and simple option. 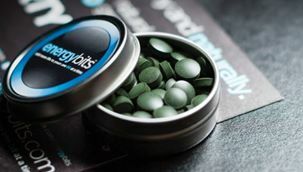 Energy Bits are tiny nutritionally dense algae tabs that work to eliminate fatigue and hunger without sugar or caffeine. Pop a few of these bad boys along with a big glass of water before a hard workout and you'll have more endurance! We all love workout clothes because they're super comfortable. Unfortunately, what makes fitness apparel comfy, also makes it unsustainable: plastics. Plastics in nylon and polyester make fabric stretchy and dry quickly, but of course are derived from petrochemicals. Cause I Run is tackling this challenge by offering sustainable fitnesswear. They use recycled materials to create their designs, and like Janji, they will also give back to a variety of causes. We are eagerly awaiting Cause I Run's launch - sign up for their e-mail list to learn more details about when their line will be available. Already making a name for themselves, Crane & Lion is one of our favorite athleisure brands. With great yoga pants and comfy sweaters in chic colors, C&L has everything we need to look good straight from the gym out to brunch. The best part is that Crane and Lion also gives back through their "Connect & Contribute" initiative, and many of their partners are hyper-local - like the Big Sister Association of Greater Boston!